There is nothing like discussing a good book with friends. 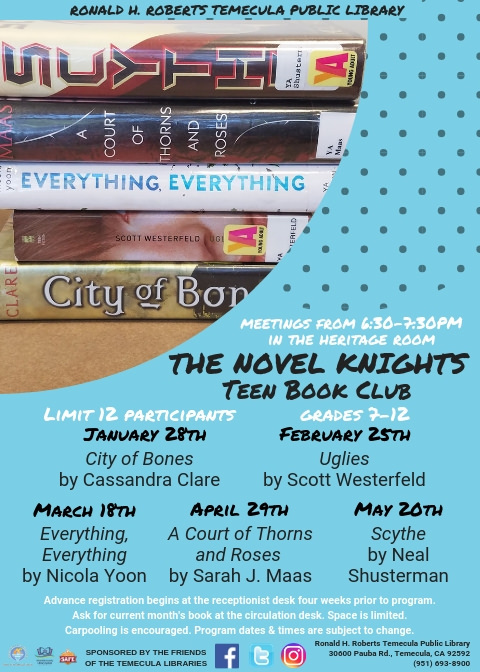 Join us for the first meeting of the year of The Novel Knights teen book club! Copies of City of Bones by Cassandra Clare will be available at the circulation desk prior to the event. Come prepared for a fun discussion and a few snacks. *Advance registration begins at the receptionist desk four weeks prior to event. Ask for current month's book at the circulation desk. **Space is limited. Carpooling is encouraged. Program dates & times are subject to change.